Carol M. Highsmith Interview: Famed Photographer Captures the Soul of Washington, D.C. Veteran photographer Carol M. Highsmith has photographed every state in America, the District of Columbia, and Puerto Rico for the past 30 years. But, she began on a journey in February 2010 to photograph America state by state and to donate those images, copyright free, to the Library of Congress. Highsmith spent four months shooting images in the first state, Alabama, which will become the George F. Landegger Alabama Library of Congress Collection. She recently completed a shoot in the Washington, D.C. area. The 64-year-old D.C. resident took images of the Capitol and surrounding Monuments, of Rock Creek Park, the old National Capitol columns at the Arboretum, the historic buildings, statuaries, and the beautifully diversified row houses in the city, just to name a few. Melissa Parker (Smashing Interviews Magazine): Carol, are you finished photographing Washington, D.C.? Carol M. Highsmith: I’m through for the moment, at least for the neighborhoods. I do a lot of work for the National Mall and Memorial Parks. As a matter of fact, I recently finished the official views of the Washington Monument for them. They are the ones that actually hang in the Monument that show the view, and it tells you what you’re looking at. They haven’t replaced them for years. Melissa Parker (Smashing Interviews Magazine): George Landegger funded Alabama. Is he involved with D.C. also? Carol M. Highsmith: Yeah, he funded D.C. and his granddaughter and a friend of hers worked with me as interns for the summer. I put in a couple of photographs of Monuments and of the Capitol, but mostly it was all neighborhoods because that’s a part many people don’t even see. They are focused 100% on the White House and all of the Monuments. They don’t really know what exists beyond those places. Many times they don’t go beyond it. They’ve never stepped foot in a neighborhood in Washington, D.C. It’s a totally unique city. It’s so funny to go from 20,000 miles in Alabama to 68 square miles in Washington. D.C.
Melissa Parker (Smashing Interviews Magazine): How long were you photographing the city? Carol M. Highsmith: It took me quite a while and I did 1,000 images rather than the 4,000 I did in Alabama. Alabama’s done, but I still have to give the images to the Library of Congress. The D.C. images aren’t up yet there. It takes them two or three months to get them up. Melissa Parker (Smashing Interviews Magazine): I think my favorite D.C. photo is the old capitol columns. Carol M. Highsmith: Isn’t it neat that they saved those? Melissa Parker (Smashing Interviews Magazine): Yes. Did you use infrared on that shot? Carol M. Highsmith: Yeah. I followed in color so there’s a color version, too. I usually follow everything I do in color. But, it was fun to do something a little different with them. That they saved the columns and put them out there is so neat, and it’s just an arboretum with plants and things. In Washington there’s every configuration of row house you can imagine. Most are attached with an interesting history. 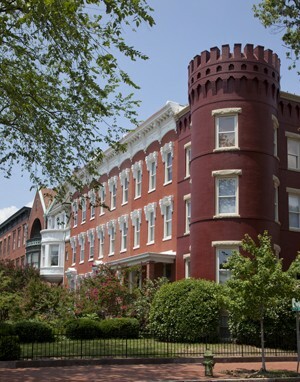 For instance, there are beautiful historic row houses at LeDroit Park. They were built 100% as a white neighborhood and fences were put up. In 1988 the students of Howard ripped them down and now they are predominantly black. Melissa Parker (Smashing Interviews Magazine): I believe Rev. Jesse Jackson lived there. Carol M. Highsmith: Yeah, many famous black people lived there. It’s a fabulous neighborhood. I would move there in a minute. It’s gorgeous, absolutely pristine. The interesting thing about the D.C. row houses is the fact there is such a different look to every neighborhood. I kept thinking I would get tired of them because there are so many, but everything has such a different feel and look to it that I had trouble stopping on row houses. I would say the majority of Washington is row houses. Melissa Parker (Smashing Interviews Magazine): As an architectural photographer, I imagine you had a field day on buildings also. Carol M. Highsmith: That was another thing. 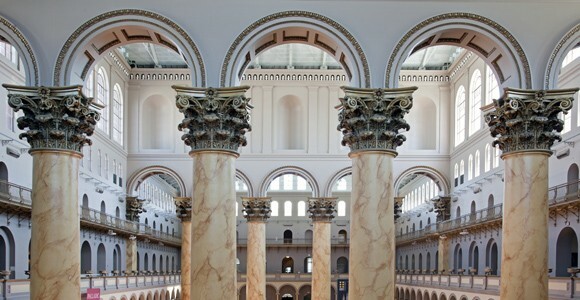 I think the Library of Congress wanted me to do a bit more architecture in D.C. The D.C. Preservation League that gave me the list wanted me to do more people so I kind of swayed toward the Library end of it, but I’ll probably still go out and get more people, too, as time goes on. The architecture is, in my estimation, fabulous and magnificent. Melissa Parker (Smashing Interviews Magazine): The Rock Creek Park Bridge is beautiful. Carol M. Highsmith: Rock Creek Park is the largest inner city park in America, to include New York if I’m not mistaken. Melissa Parker (Smashing Interviews Magazine): Is that park in the heart of the city? Carol M. Highsmith: Yes it is. I can leave my house, drive for five minutes, go through the park all the way to Georgetown, and never know I was in any city at all. If you put blinders on me, I’d be totally and completely clueless. 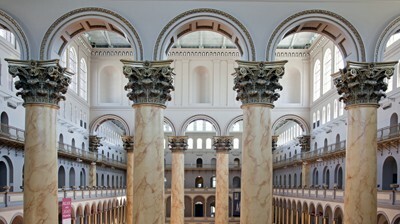 Melissa Parker (Smashing Interviews Magazine): I was reading about the National Building Museum. The man that designed it was an officer in the Civil War and it was created by using more than 15,000,000 bricks. Legend has it that the architect, Montgomery C. Meigs, counted each and every brick. Carol M. Highsmith: I took images of the Civil War frieze all the way around the building. D.C. was majorly swampland until the Civil War and that’s what really brought it to life. The Civil War really started this town popping. In the 1960s I came from across the river and watched Washington burn. When Martin Luther King was killed Washington D.C. was gone. After that the people very slowly started taking a chance on it. Melissa Parker (Smashing Interviews Magazine): There were many race riots going on in the 1960s. Carol M. Highsmith: Yes, it was a place you did not go from the day King died until years after. I believe they did call the National Guard and they were everywhere you looked. One time I was at the Library of Congress and they said that New York was such a dangerous place after 9/11, but actually we (D.C.) are sitting at Ground Zero 2. I’m sure we are very much a target. Recently someone took about six shots at the Pentagon. I can’t even fathom how that happened. You know, I started in the Willard Hotel when it was nothing but a rat trap. I mean, that’s the history of me. To see the restoration and renovation of not only Pennsylvania Avenue, but the neighborhoods also, is just mind boggling. You can’t even conceive it. It’s just fantastic. And talk about famous people who have lived on Connecticut Avenue! The list is endless and it’s only ten minutes away from the city. I can go downtown still today and drive from the Capitol to Georgetown in ten minutes. It’s a big city small town with many layers: government, the private sector, and everything in between. The great thing about it is that it has this government paycheck every two weeks so that helps keep houses painted, although they have all, from time to time, been in tremendous disrepair. Melissa Parker (Smashing Interviews Magazine): Your statue photos were fascinating! Carol M. Highsmith: Oh yes, the statuary is beyond belief! Melissa Parker (Smashing Interviews Magazine): The Dupont Memorial Fountain by sculptor Daniel Chester French is gorgeous. Carol M. Highsmith: Yes, I zeroed in on his work on the fountain. French’s best-known work is the sculpture of a seated Abraham Lincoln at the Lincoln Memorial. Melissa Parker (Smashing Interviews Magazine): There are murals everywhere between the row houses. Carol M. Highsmith: That’s correct. I didn’t see them all. I’d be rolling along and I’d screech on the brakes in order to get a shot of the murals. It’s a very eclectic and ethnic area, and so populated at night you can hardly move. Of course, there are bars and restaurants everywhere. Melissa Parker (Smashing Interviews Magazine): Would you say your favorite images were the row houses and the architecture? Carol M. Highsmith: Oh yes, and the Library of Congress wanted me to concentrate on them. On Capitol Hill you see the row houses and their diversification. Melissa Parker (Smashing Interviews Magazine): There are about 35,000 people living in just under two square miles! Carol M. Highsmith: I know (laughs). It’s interesting because the streets are kind of wide and it’s located near the Library of Congress so I’m there a lot. I don’t ever feel like, “Oh my Lord, there’s so many people here!” It’s just a beautiful neighborhood. There is so much to see in D.C. There’s the architecture, the diversification of the row houses, the murals, Rock Creek Park, and the old capitol columns. These are all just minutes from “White City” and all of the monumental buildings. There are interesting stores and restaurants on 14th Street and everywhere you look. In ten minutes I could be at the Capitol from any of these places. That is what is so neat. Melissa Parker (Smashing Interviews Magazine): Did the Library of Congress want you to take helicopter shots? Carol M. Highsmith: I’ve been up in a helicopter many times over D.C. The only way you can go up is with the Park Police who are the same people that protect the president. You have to get completely cleared and there have been years when I haven’t been cleared. The last time I went up I went all over the White House and grounds, got back to the helicopter pad and my name was announced. I went in and the Secret Service was there and they took my memory card. Melissa Parker (Smashing Interviews Magazine): What happened? Carol M. Highsmith: They just are so funny. I was shooting for the National Parks Service, not for me. It’s not something you can pay to do. You have to be doing it for someone. Of course, I give everything to the Library of Congress. I’ve photographed the Library of Congress from the air and they would never have those images had I not done that. But they have just gotten very sensitive and I don’t blame them. I photographed Blair House and they had to look at every single shot I took before I left the place. They were very sensitive about certain areas. I used to photograph the Capitol inside at night. It’s just filled with art. After a while the guards all knew me and I’d just swing in with thousands of pounds of equipment. Well, the guards there were killed a couple of years later. People used to just meander around in there, but that’s not the case anymore. I used to drive up to the Capitol and have lunch with a friend of mine and I’d park next to Tip O’Neill’s car and just go on in. You can’t park anywhere near the Capitol anymore. Things have changed drastically. Melissa parker (Smashing Interviews Magazine): Did you take any photographs at the Willard Hotel? Carol M. Highsmith: No, I didn’t bother because I have so many. I’ve just photographed it to death. The night before it actually reopened I was photographing it and I heard a knock on the door. It was Mary Martin and Carol Channing! There was a bomb scare at the National Theatre. They were in a play and the whole audience was chasing after them (laughs). I told them that the only way I’d let them in is if I could photograph them. I was thrilled because I had seen Mary Martin in Peter Pan in New York. I’ve kicked around D.C. forever. Melissa Parker (Smashing Interviews Magazine): Have you sent the D.C. photos to the Library of Congress? Carol M. Highsmith: They’re all there. They say they’ll be up on the site around the end of November. The Library has to test the software and it has to be completely virus free. They found some software that will allow them to pretty much vacuum up my images, but they have to test it first. Melissa Parker (Smashing Interviews Magazine): Does Ted Landphair, your writer husband, travel with you to photograph the states? Carol M. Highsmith: Often times he does. Ted does a blog for Voice of America on America. We both love to travel together. Our goal is just to be together all of the time. All of the books I’ve done (other than a couple) have been written by him. Ted’s the author and I am the photographer. It has been a dream to be able to do that together. I’m not worried about getting the next three states. I will probably start on the next three in February or March of next year. I’m not concerned at all about doing three a year. Hopefully the next time we talk after the next place we visit I’ll be able to share where I will be going next. I’m hoping to pick up three a year almost simultaneously so that I’m not clamoring for the three. I don’t have a definite date yet, though. Melissa Parker (Smashing Interviews Magazine): Will George Landegger be involved in the next state? Carol M. Highsmith: No, but I think he’s going to help me in any way he can, though. He’s very happy with the images thus far and the coffee table book. I went to a party where Dr. Billington (Library of Congress librarian) spoke. He has always been a fan of mine and went nuts over this project. He asked me if there was anything he could do. That’s what’s so great about this. The Library of Congress is so much on my plate. They get it and they get the importance of the project. My photographs are fine and solid and that’s all well and good. The important thing here is that it’s one eye seeing it so that’s good. The second thing is that it is of utmost importance to our nation that we do this. Film has almost gone away and digital will go away. Everybody says, “We’ll have it.” Well, will we? Most of the areas in D.C. have historic designations so they can’t be touched, but there are some that don’t and I raced out to those because I’m very worried that somewhere along the line they will be gone. There may or may not be a record of them. There were comments under the Washington Post story and someone said, “Well, gee, you can just get on Getty and see some of these images that have been taken on America.” I got on there and said, “Yes, if you pay for them.” My photos are there for free and for keeps with no end date on them. Recently they have found that some of the images that were taken in the Dust Bowl area by people like Dorothea Lange were saying one thing and the people who spoke about those times were saying something totally different. The photographs, of course, were the truth. Melissa Parker (Smashing Interviews Magazine): Yes, they do not lie. Carol M. Highsmith: No, unless they’ve been retouched, I guess (laughs). The other thing I read recently is that our audio files are disappearing very quickly. We are losing tapes that were taken of Indians and our language is changing. Will there be a Southern language as we migrate all over the place? Maine is very distinct, but will that accent be there 50 or 100 years from now? Will there be color in people? That’s why images are so important. © 2010 Smashing Interviews Magazine. All rights reserved. This material may not be published, broadcast, rewritten or redistributed without the express written consent of the publisher.